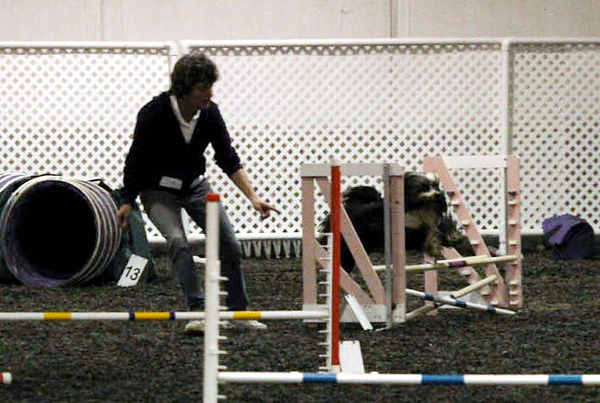 FREE PHOTOS: Due to the poor lighting conditions at the agility trial increased by indoors, rainy day, very dark floor and high speeds of agility (plus some dog's being mostly black) today's affordable photography equipment has a difficult time giving clear prints especially in larger sizes like 8x10s. Grainy photos are common under these conditions. Flash photography would have been required at this trial however it may distract the dogs so shouldn't be useed during competition. The smaller versions of photography under these conditions are better. The photos here on this site are in low resolution for emailing, websites, Facebook, Etc. Simply right click on the photo(s) of your choice and save to your computer. I've decided to give them all free in this low resolution format because of the extremely poor lighting conditions. Next year, I'll try to bring additional lighting equipment if its possible to get electricity for some strong lighting - I was not aware that the TTCA wanted candid shots at this trial. Or if its outdoors, that would be much better for photography. Video equipment does much better with these conditions so I suggest you contact the videographer if you'd like clearer images. They probably won't be able to give you clear photographs but the videos will be fun to own/watch.